Herblore can be a really confusing skill and not all players know how to start training herblore, but its not as hard as some people might think. Herblore is often seen as an investment that in the long-run will earn you money; However, if you plan to create and collect your supplies yourself, that investment easily turns in to a great way of making money while gaining herblore exp. Since the exp rates from herblore has been reduced, herblore has grow as a more harder skill to master. Here are the following things you will be needing to successfully train herblore. There are multiple ways of gathering herbs in Emps-World. You can either farm them yourself if you have the required farming level for it, kill monsters who drop herbs (almost every monster in the game drop some kind of herb) or you can simply buy them from other players. 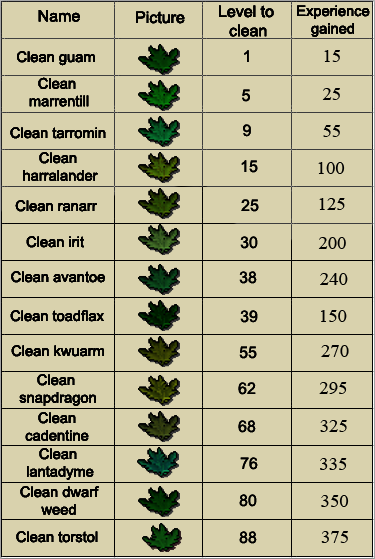 Without the correct herblore level, you will not be able to clean the herbs to use them. To clean an herb, simply left-click it and it will quickly change to a clean herb. Vials are one of the most common items in the game since they are easy to obtain. They can be bought in any general store and costs 1gp per vial; however they can also be bought from players in a “Filled” form which will save a lot of time but will cost over 1.000gp per vial. If you are planning to gather them yourself, you're going to have to fill them with water before you can start making potions. There are multiple ways to fill vials, the easiest and cheapest way of doing so is to simply left-click on a vial (use) then left-click on a water source (NOTE: That not every water source in the game works such as wells). Remember to always look for this icon: on your mini map which indicates were vials can be filled with water. The second method requires 68 magic and member to be able to cast humidify on the lunar spell-book. This spell will fill all your vials in your inventory and costs 1 astral rune, 3 water runes and 1 fire rune. Good monsters for low level herbs: Black knight, Hill giants, Moss giants, Dagganoths (level 74), kurask and Giant champions. Good monsters for high level herbs: Dagganoths (level 92/Mothers), Skeletal wyverns, Blue/Red/Black dragons and Cockatrices. Since august 07, 2012 you no longer have to be high combat level or rich to master the skill of herblore, you could now farm herbs south of Falador (2 patches) and in Catherby (2 patches). To be able to do so you will first have to receive your wanted seed, which can be obtained by pickpocketing farmers and master farmers. Now to plant a herb seed, left-click (use) on a your seed of choice then left-click on a seed dibber (NOTE: This require 2 seeds per patch). Eye of newt & Chocolate bar/dust, Unicorn horn/dust, Limpwurt root, red spiders' eggs, white berries, snape grass, mort myre fungus & potato cactus, wine of zamorak, jangerberries, crushed nest. 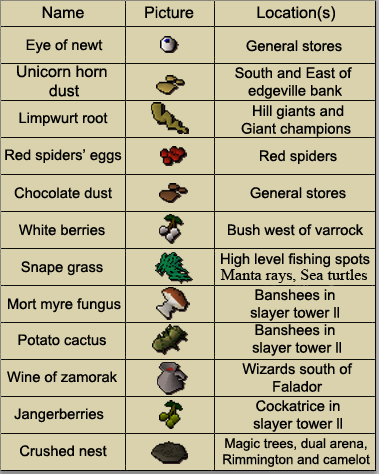 Some of the ingredients require you to have a certain slayer level to kill certain monsters; learn more about Banshees and Cockatrices by left-clicking on the slayer skill guide in the game. Clean guams and create attack potions, which require a clean guam, an eye of newt and a vial of water. Do this till you reach level 5 and then clean marrentills until you reach level 8 were you will start making antipoison to level 9, which require a clean marrentill, some unicorn horn dust and a vial of water. Create attack and antipoison potions along with cleaning tarromins. Do this until you advance to level 14, then start creating strength potions (Tarromin,limpwurt root and vial of water) and once you get level 16+ you should start making restore potions as well (Harralander, red spiders' eggs and vial of water). Keep doing strength potions and restore potions until you reach level 19. At this point you should start creating some energy potions (Harralander, chocolate dust and vial of water). Once you get level 25 is where it starts to cost some money. At level 25 you can start cleaning ranarrs, they are however quite expensive and should only be used while making prayer potion at level 35. Therefore making defence potions (ranarr, white berries and vial of water) is only recommended if you don't mind wasting a little money. If you're planing on earning your levels a bit more economically, I would recommend you to keep making the same potions as before until you reach level 35 (Energy potions, restore etc). This is the point where you can start earning some money while training the skill of herblore. 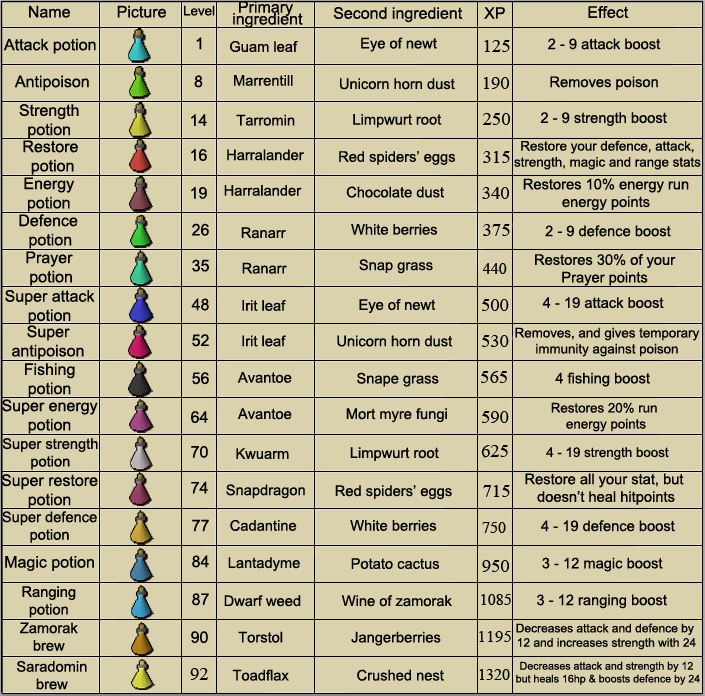 You can now make on of the most useful potions in the game, Prayer potions (Ranarr, snap grass and vial of water). It's recommended to keep doing prayer potions all the way to level 48, since your now such a high level that cleaning herbs won't earn you much exp. Super attack potions are also one of the more commonly used potions, which means they are also decent way to earn money. Attack potions require Irit leaf, an eye of newt and a vial of water. There are 2 recommended method to keep training herblore, the economical way or the quicker but more expensive way. Keep making prayer and super attack potions all the way to 70. 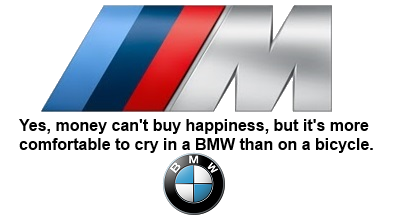 This will not only save you money, it will also earn you quite a lot of money in the long run; however will take longer time to reach level 70 than it normally would have done. Make super antipoisons, super antipoison require irit leaf, some unicorn horn dust and a vial of water. Do this to level 56, where you start making fishing potions followed by super energy potions at level 64. both of these 2 potions are hard to sell and costs fairly much to make, they will however save a lot of time and will eventually take you to level 70. Now once you have made it to level 70 you will notice that every 70+ potion is worth the time and money doing, since the they all give fairly much exp and money if you sell them to other player for the right price. I recommended you to make the best potions you can make at your current level to get the best exp/hour. Q: Is training herblore worth the time and money? A: Yes, herblore is definitely worth training not just only if you're planning on becoming a maxed, it is a big money saver for all types of PKers. For example if you're normally buying Zamorak brews for 100k each, while someone with 90 herblore just buys the ingredients for a total of 70k and also receives experience for creating them, That way creating your own potions is more beneficial than just to buy them strait out of players. Same goes for prayer potions for pvm etc. Q: Will the experience for creating potions ever be raised back to “normal” again? A: Probably not, since you now can farm your own herbs with the farming skill; instead of only killing npc's for them. Q:Will potions as: “Extremes” and “Overload” ever be added to the game? A:It is possible after the graphical-update, however there are no plans on adding them as far as I know. The Herblore skill cape can be bought along with the other skill capes just outside falador castle for 158593 coins from King Percival. The experience needed for level 99 is 13,034,431. The guide is looking great! Have you double checked all of the experience? Thanks, I think they are all right. You're saying some of them are wrong? Excellent guide, I'll be sure to use it to get 99! Looks mighty fine, really well done! This guide looks totally fine and well-written.